You can climb aboard most of these ships, and even take cruises on several of them. Mystic Seaport Museum is noted for many excellent historical exhibits, but none more than their real boats and ships which include the last known whaling ship afloat, and a century-old coal-fired steamboat. 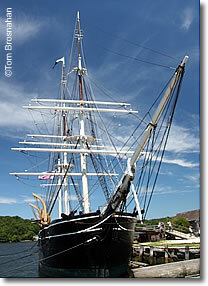 The Charles W Morgan is the last wooden whaling ship in the United States still in the water. Launched from a shipyard in New Bedford, Massachusetts in 1841, she sailed continuously for 80 years. The last whaling ship of her kind (out of 2,700 which once plied the seas in the age of whale oil lamps), the Morgan has been fully restored (2014) and is again seaworthy—and sailing. You can see other whaling ships and exhibits in the New Bedford Whaling Museum and Nantucket Whaling Museum, but only the Morgan is still afloat. You'll explore the whaleship Charles W Morgan, but right on the same wharf, and even more fascinating in its way, is the much smaller whaleboat. The ship took whalers to the hunting grounds, but it was from this small boat that the men actually harpooned the whales. Only by seeing such a small boat and its simple equipment can you appreciate the courage and audacity of these maritime hunters. The fishing schooner L A Dunton (1921) recalls the great age of the New England fishing fleet. The full-rigged training ship Joseph Conrad (1882) is yours to explore, and imagine what life was like at sea. The cabin of this ship built in 1883 is typical of the accommodations aboard a "Down Easter" or "Cape Horner," the large late 19th-century ships that sailed in record time around the Cape Horn, connecting the east and west coasts of the United States in the era before the railroads. Changing exhibits of real boats—anything that floats and was used for transport on the sea. Above, whaling ship Charles W Morgan (1841).